Below is another item from HYee Auctions. I thought this deserved it's own post. 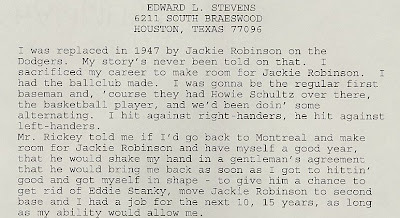 Ed Stevens was an up and coming 1st baseman with the Brooklyn Dodgers from 1945 to 1947 until he was sent down to Montreal and eventually traded to the Pittsburgh Pirates. At one time he seemed destined to be a mainstay on the big club until a certain ballplayer came up. 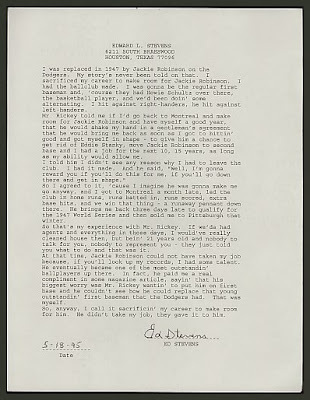 As you may know, Ed Stevens is known to be the person who lost his job to Jackie Robinson. He writes his story below about the fateful event.